How to Backup Windows 10/8/7 on System Shutdown? Backup Windows 10 on system shutdown can save a lot of problems. The AOMEI Backupper helps you backup Windows 10/8/7 automatically when you trigger system shutdown. Computer users know that it is necessary to backup Windows after installing operating system on. So, most of them backed system up once they installed OS. However, data will be changed and increased with the use of computer. In order to keep the newest data safe, the best way should be setup an automatic incremental backup. Because if you forget to backup after changing the data, the backup task will be executed automatically. 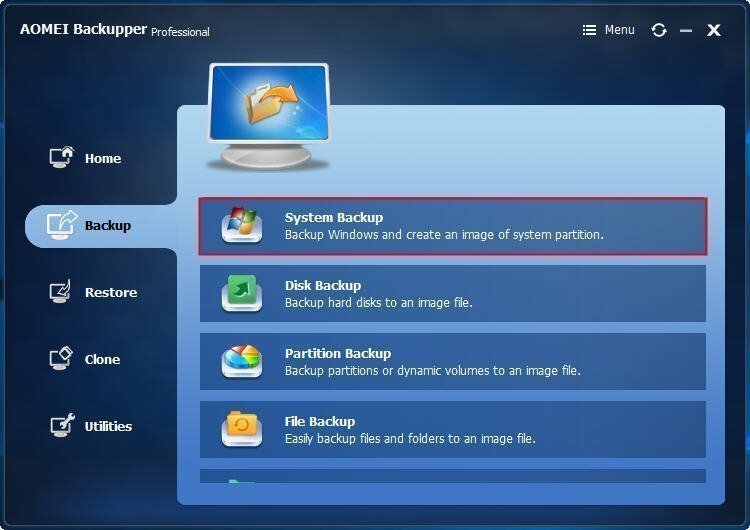 Backup Windows 10/8/7 on system shutdown is fantastic that when you press the Shutdown button of your computer, it will execute the backup task immediately - You won’t miss any data in any situations because you have backed them up timely. How to backup Windows 10 on system shutdown? It is great that you can backup Windows 10 on system shutdown. But how to make it? If you don’t know, you are very fortune to read this article because here we will introduce you a very effective way that can help you backup Windows 10/8/7 on system shutdown. That is using AOMEI Backupper, a professional backup and restore software, which provides you setup full backup, incremental/differential backup on different event triggers including System shutdown. 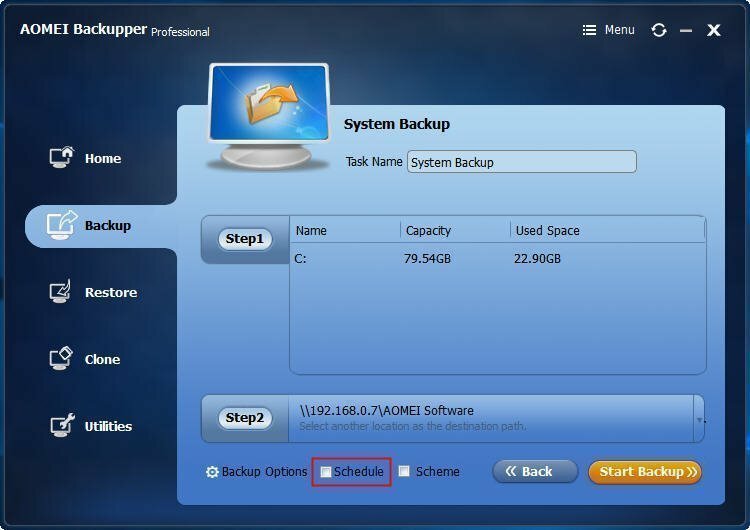 After setting up an automatic backup with the System Shutdown of event triggers of AOMEI Backupper, your computer will be shut down after finishing the backup task when you press the Shutdown button. Next are the main steps of how to backup Windows 10 on system shutdown. Step1. Install and launch AOMEI Backupper on your Windows 10. Select System Backup under the Backup tab. Step2.The System Backup will select all system files in default, and here, you just click Step2 in the following screenshot. You can backup Windows 10 to external hard drive, or back it up to NAS, or another local hard drive, etc. Here we choose to backup Windows 10 to NAS. 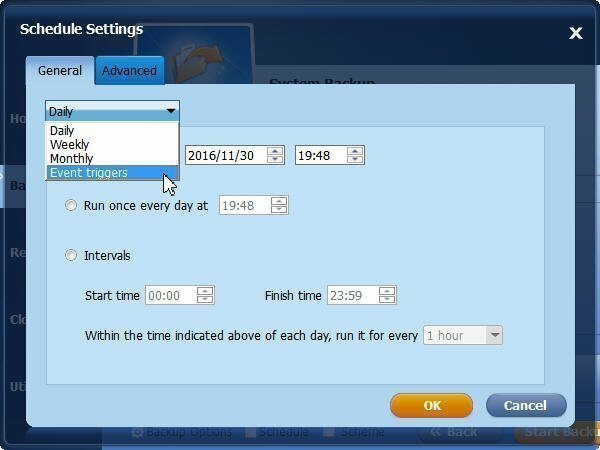 Step3.To do an automatic backup on system shutdown, here you need to click Schedule, then, selectEvent triggersat the General tab. Step4. Then, it will skip to the Event triggers interface, and you can select System shutdown as the event type to run your backup task. Click OK.
● AOMEI Backupper do an incremental backup in default, if you need to change to full backup or differential backup, you can click Advanced to setup. 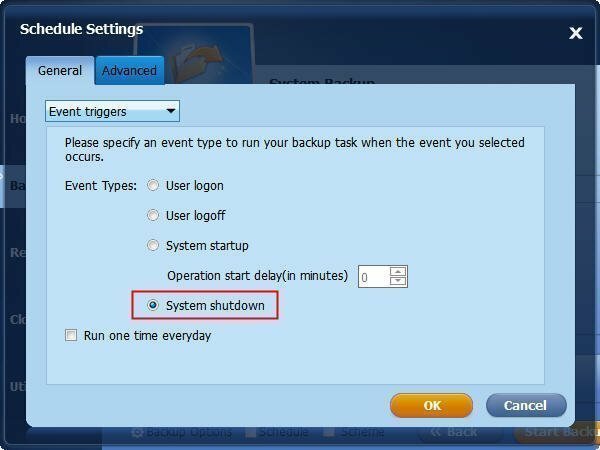 ● As you can see, you can set up many event occurs to execute your backup task once you trigger that. Step5. Then, back to the system backup page, and click Start Backup to finish the schedule backup at system shutdown. So far, you have already finish the job of how to backup Windows 10 If you need, you can use AOMEI Backupper to restore computer system to an earlier point time with the those system backup images. If you are server user, AOMEI Backupper Server is suitable for you.